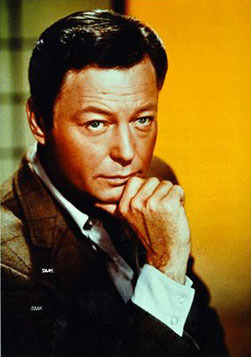 DeForest Kelley wanted to be a doctor when he was a boy, but during the Depression of the 1930s medical school was beyond his means, and instead he became an amateur singer and later a professional actor. Kelley made his film debut with a featured role in a low-budget thriller, Fear in the Night. Based on a short story by Cornell Woolrich, he played a man who dreams a bloody crime and finds his dreams come true. Kelley had an accomplished Hollywood résumé before Star Trek, but he had been typecast as a bad guy, in films like Raintree County, Warlock, and Gunfight at the O.K. Corral. Kelley said that his portrayal of Dr. Leonard "Bones" McCoy on Star Trek was inspired by his own family's crotchety doctor, and he played McCoy as a plain old fashioned country MD who just happened to work in outer space. In the voyages of the Star Ship Enterprise, McCoy chased Alice in Wonderland, healed a horta, OD'd on cordrazine, delivered Julie Newmar's baby, and devised cures for several diseases no man had ever had before. During Star Trek's run, Kelley became the first actor to be profiled in the Journal of the American Medical Association. After Star Trek, Kelley took guest roles in episodic TV, but he stopped accepting such offers after the early 1980s -- except for one brief appearance as 137-year-old Admiral McCoy in the premier episode of Star Trek: The Next Generation in 1987. He also, of course, played McCoy in Star Trek cartoons, Star Trek video games, and six Star Trek movies, and made hundreds of appearances at Star Trek conventions. His last film was Trekkies, the 1997 documentary about Star Trek fans. Long before he was successful, Kelley fell in love with a struggling actress, Carolyn Dowling, when they co-starred in a 1942 stage production of The Innocent Young Man. They dated for three years, and were married for 53.